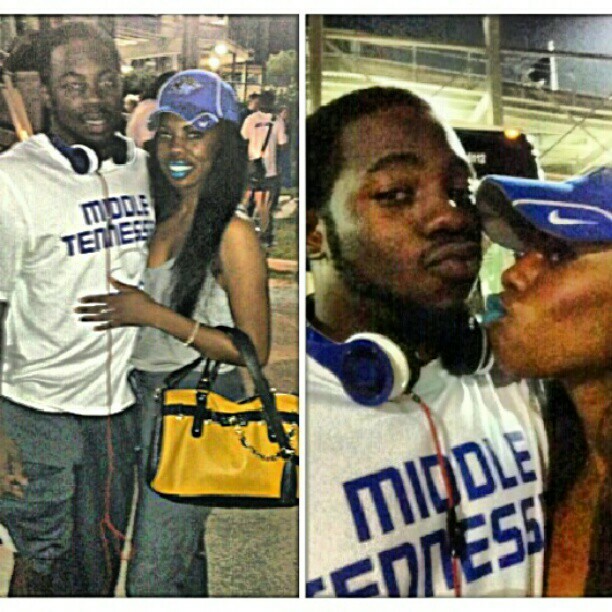 Meet Khari Burke, current junior and Corner Back for the Middle Tennessee State University Blue Raiders. GO BLUE! This featured dream chaser is near and dear to my heart, mostly because I used to change his diapers… and, he’s one of the most humble and unknowingly wise people who I know. Yes, he’s my kid brother, but that’s not why he’s featured in this post. A few weeks ago he came home for winter break and I couldn’t help but be inspired by his dedication to working hard at his craft , even in the off-season. Early morning workouts with fellow teammates, beach runs on the sand… You name it, he was on it. Football has been a major part of my family as I have relatives that have played in the NFL and brothers that have played football from the time they were in middle school, until college. With Khari, football is something that he became passionate about as early as elementary school. In fact, I remember when he was in middle school and he begged our mother to let him play in a local optimist league, and she declined. Finally he got an uncle to agree to sponsor him, and the rest is history. All throughout high school he would get an earful from me as his big sister to make education his #1 priority. As the first in my family to graduate college, I wanted to set the bar high and show those that followed how important and attainable an education is (not only for the sake of a degree, but for the sake of learning will power and the priceless experiences and relationships formed along the way). Well, I always assumed that my words fell upon deaf ears as they typically do when little brothers feel that their being preached to. That could not have been further from the truth. Back in 2009, Khari had transitioned from optimist to high school football where of course around the same time he was hit with the “what do you want to do with your life?” question. His response, “play football…” From there he made the decision on what path he wanted his life to take, of course not without a few bumps in the road. And ever since, the Universe has conspired in his favor. As a broadcast journalism major in college, I used my editing skills and resources to help him put together a highlight tape during his junior year. I even introduced him to my good friend and schoolmate New York Giants safety Kenny Phillips for a bit of inspiration. My oldest brother, who had been a top college football recruit before experiencing career ending injuries, orchestrated a plan that would take Khari from a no-name highschool player (then, no player from his school had been given a football scholarship in years) to a nationally ranked and highly scouted cornerback. His only requirement for such cooperation was to give it everything he had every time he touched the field and make sure that his grades were excellent. He kept his end of the bargain, and so did we. Just a few weeks after uploading his highlight film on YouTube our mailbox was flooded with recruiting letters from top Division I universities. Khari now had options to choose from, and MTSU was at the top of the list. 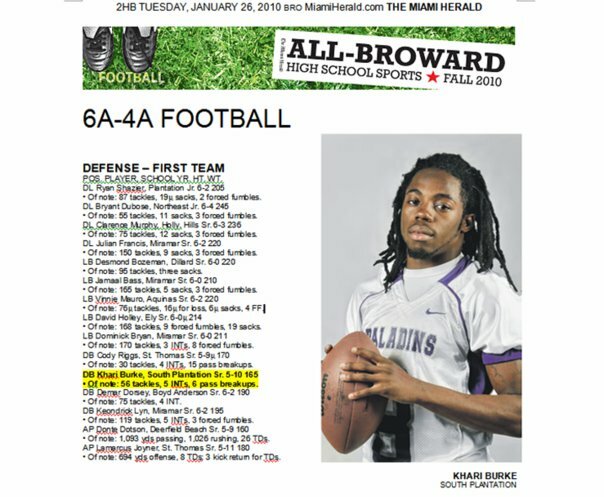 He even caught the attention of local media, and managed to make his way onto the All County First Team, and also played in the Dade vs. Broward game. These days he’s hitting the books harder than ever and has made the dean’s list just about every semester during his college career. Against all odds, Khari continues to show just how far hard work, dedication, and belief in one’s self can take you. He puts the “student” in student athlete as he is now a red-shirted sophomore on academic course to receive his Master’s degree before leaving college. Those things, coupled with the power of God and the workings of the Universe, make for one heck of a recipe. Kudos to him for leading by example and being an inspiration to others, especially his big sis. Love you KB and may all your dreams continue to come true!